If you are not a blessed bilingual, traveling in Europe can be a bit confusing at times when you realize certain places have two names or one name covers more than one object. The former is called binominals, the latter is called pleonasm. It is not difficult to decipher what the name is if it sounds alike in both languages, or at least if spelling looks similar. But what if it sounds and spells like chalk and cheese? Is Cima Nera the same as Corno Nero? Here is a list of Italian/German binominals that you can find aplenty in Northern Italy. (sometimes spelled without Umlaut) which the Italians call simply Cima Nera. The mountain lies on the border between Austria and Italy At 3,628 meters, it is the fourth highest peak after Wildspitze, Weißkugel, Hinterer Brochkogel in the Ötztal Alps. The northern side is glaciated almost to the top, the south side is rocky. The N-face is in better shape than the Similaun north face. The normal ascent from the west is a nice, easy glacier climb from Martin-Busch-Hut. Fewer people climb the Hintere Schwärze than the popular Similaun. Saslonch (Ladin), Sassolungo (Italian) or Langkofel (German) (3,181m) is the highest mountain of the Langkofel group in the Dolomites in South Tyrol, Italy. The name translates to "long peak" / "long rock" in all three languages. It stands over the Ladin community of Val Gardenia. The climb to Sassolungo is clearly suggested to experienced mountaineers/climbers while the hike can be done by almost everybody (a very rewarding family walk). The Langkofel group features eight major peaks with Sassolungo being the highest. The others are Sassopiatto (the only one that can be reached without climbing), Dente, Torre Innerkofler, Cima Dantersass, Punta Grohman, Punta Cinque Dita, Spallone del Sassolungo. The group is still not so much crowded even in August which is hot vacation period in Italy. 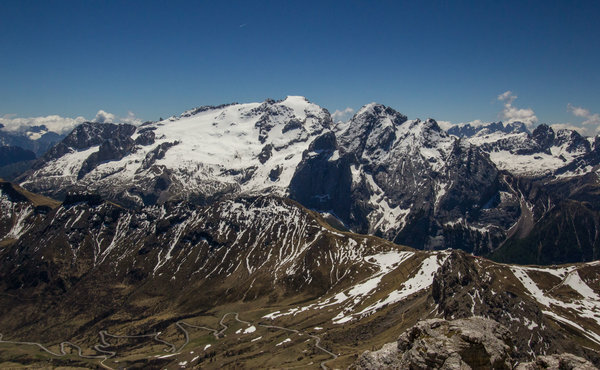 The only crowded areas of the group are the path that crosses the Langkofel group connecting two Rifugi (Demetz and Vicenza), the path performs the tour around the group and there are two easy ways to summit the Sassopiatto (you can use a via ferrata or go on foot). If you enter within the group the crowd disappears, but the real show begins. So if you are not afraid of being alone in a wild mountain find the way to explore the inner parts of Sassolungo/Langkofel group.killed in two separate incidents. On June 23, 2013, six were killed, also in two separate incidents. Gran Zebrù (Italian) or Königspitze (German) is in the South Tyrol and is the second highest peak in the Ortles Alps. Many people think that the name "Koenig Spitze / Königspitze" means peak of the King, but the origin is much more mundane. Back in the 18th century, the mountain was very rich in iron, thus there were plenty of iron mines on its slopes. In local dialect of the Italian side the mines were named "cunicl", it means "little drift". On the German side the word "cunicl" was changed in Koening because the sound is the same. Gran Zebrù was first climbed on August 3, 1854 now it presents three main climbing routes: a superb ice-mixed north wall (there was a famous climb on overhanging ice cornice by Kurt Diemberger), and a not-easy normal route, plus a mid-difficulty northwest ridge. You need a good stability on crampons thinking about a climb on ice and snow with steepness up to 45-50 degrees on the normal route. The peak can be achieved in various points. Going directly towards the cross will not be easy but it will help avoid crossing of the edge with ice cornices above the north wall. In the absence of cornices, the ridge is the best way. In this case, pay attention because once on the ridge the abyss on opposite side appears suddenly! The mountain can be dangerous in warm weather, when the snow and ice can become unstable. The worst day for climbing fatalities on the mountain occurred on August 5, 1997, when seven people were killed in two separate incidents. On June 23, 2013, six were killed, also in two separate incidents. The Mountain bears two names. The German name is derived from 'the Signal', a prominent gendarme – a pinnacle of rock on a mountain ridge that is typical of Alpine areas, they are formed on the intersection of two ridges due to the lower erosion of glaciers there. The name originates from the French Alps, where they were seen as resembling the gendarme police. The Italian name comes from the priest Giovanni Gnifetti who was the first to climb the mountain in August 1842, he went with seven guides from Alagna. The Monte Rosa group excited the interest of the explorers for a long time. Alpinism history in Monte Rosa group began in 1778, when seven Italian people from Gressoney went up from south side to discover the mythical lost valley: they believed that over the mountains and the ridges existed a paradise, with animals and fruit-threes, an ancient home of their ancestors. The higher point to reach by the seven people (at about 4000 meters) was called "stone of the discovery – Monte Rosa”. Probably, more people gave the Monte Rosa peaks their names than in any other Alpine range. The first successful ascents were in 1801 when the priest Giordani conquered the peak that now bears his name. In the same period Joseph Zumstein, an Italian topographer from Gressoney, climbed Zumsteinspitze (4 563m), Vincent went up Vincent Pyramid (4 215m), an Austrian army topographer Ludwig von Welden climbed Lüdwigshöhe (4 341m). entertain them with fine dining, a good library, and fantastic views. It is also used as an important physical-meteorological observatory for the Piedmont Region, and a laboratory affiliated with the University of Turin. You can read about this hut and more in our blog "10 best mountain huts in Italy". Corno Nero or Schwarzhorn is the least important of the summits of the Monte Rosa range, it is located between the peaks Lüdwigshöhe and Vincent Pyramid. Hardly anyone would deem about climbing this singular rock on its own, as its prominence is just 42 meters. But Corno Nero is on the "official list" of UIAA about the 4000 m mountains of the Alps and most authors consider it as an independent mountain. So go for it! Very recommendable - and popular - is the traverse along the ridge from Gnifetti hut to the Signalkuppe. The first ascent was on August 18, 1873 by Marco Maglioni and Albert de Rothschild with guides Peter and Nikolaus Knubel, Eduard Cupelin and three porters. How could this big party have enough space on the little summit? Not to be confused with Cima Nera! Marmolada is the highest of the Dolomites and recently is the only one with a big glacier on its north face. Marmolada is "The Queen of the Dolomites" and it is situated between Sella Group (north) and Pale di San Martino (south). Its ridge is a border between two Dolomites regions: Trentino and Veneto. Its main peak is considered the Punta Penia (3343m) but it has other 4 peaks: Punta Rocca 3309 m, Punta Ombretta 3230m, Monte Serata 3069m, Pizzo Serauta 3035m. Punta Penia is accessible only via climbing, but you can choose three ways: via Ferrata to West Ridge (rocks, VF FASSA13 - Grade 4C in the Cicerone Guide) to Punta Penia, and North face (ice and rocks) and the South Ridge (rocks) or a "normal route" from the glacier to Punta Penia.The latter is short VF2 that has probably been created recently, as it is not in the books yet. It is a busy tourist route in the summer as it is accessible from the Seggiovia lift and non-technical, apart from one crevasse crossing. The second peak, Punta Rocca, is reachable by cable car. There is a current way waged between ambientalist associations (like Mountain Wilderness) and comfort lovers. The former think that too many cable cars, monstrous pylons and big buildings for cable car stations ruin the environment. There was the case in history when Marmolada cleaned itself from too much human activity. During the First World War, the Austrian-Hungarian soldiers built 8 kilometres of ice-caves inside Marmolada glacier. Their idea was to reach the Italian positions on Marmolada without the danger of enemy-fire. The “City of Ice”, called "Eisstadt" was built in 11 months (May 1916 - April 1917): inside there were beds, kitchens, deposits for the munitions. The main problem was the movements of the glacier: in 1918, the city disappeared. The peak falls on all four sides with near vertical walls, although the ledges between the rocks allow it to be climbed. 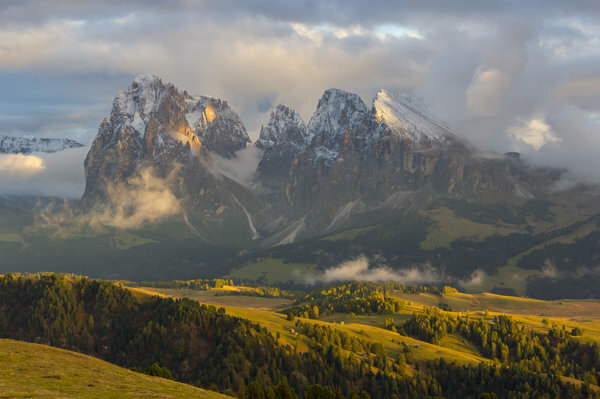 It is a popular peak to climb during the summer thanks to its summit view, which on a clear day takes in all of the famous Dolomitic peaks to the east, and the Brenta Group, and the Ortles Alps can be seen in the northeast. If Kesselkogel is the highest mountain, being the highest summit far around, it offers an immense panorama. Wonderful is the view on Catinaccio/Rosengartenspitze, which looks like a giant shell, rising high above the rose gardens of King Laurin. Even though some may say that Kesselkogel is not the most beautiful mountain in the group, yet it is the king that rules his neighbourhood, surrounded by elegant queens (Rosengartenspitze), and by knights (Vajolet Towers) who are more often photographed and admired. As to the name origin, Kesselkogel is loosely translated into English as ‘a boiler’, nothing spectacular, isnt’ it? Where is the Italian name, featuring Antermoia is much more fantasy-inspiring. The Italian/Ladinian name Antermoia comes from a landscape east of the peak. There is Antermoia valley with a beautiful lake around which still an old legend is whispered. By it, Antermoia was a girl who had to separate from her lover. Her tears filled a mountain basin and so the lake still today has her name. 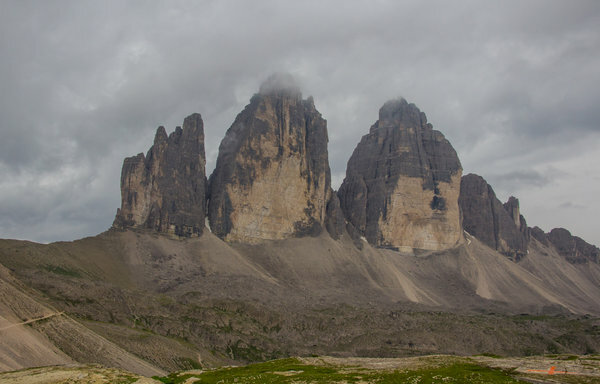 The Tre Cime di Lavaredo in Italian or Drei Zinnen in German (literally – three merlons) are quite distinctive peaks composed of well-layered dolomite stones. Until 1919 the peaks formed part of the border between Italy and Austria, now they divide Italian provinces of South Tyrol and Belluno and still are a part of the linguistic boundary between German-speaking and Italian-speaking majorities. The traditional name of the mountain, still in 1700 was Hoch Feil Spiz and was probably referred to a nearby area, the Fäule (dialect Faile) that means "swampy land". The Italian name was created by Ettore Tolomei after the WWI and probably confused the name "-feiler" with "Pfeiler" that means Pillar (Pilastro in Italian). The Gran Pilastro is the highest mountain in the Zillertal Alps on the border between Tyrol, Austria, and South Tyrol, Italy. 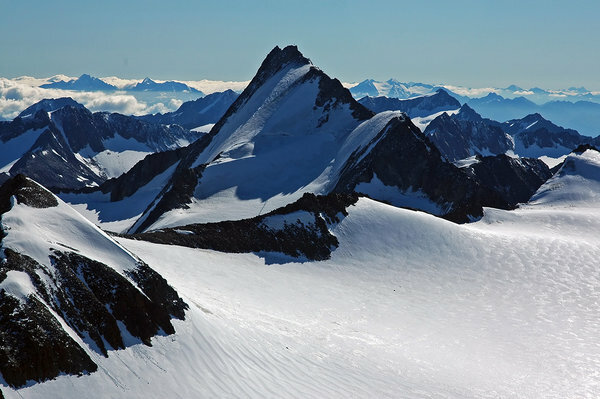 Three long ridges (NW, E and SW) separate 3 big glaciers: the Schlegeiskees (Noth East), the Gliderferner (South)and the Weisskarferner (North West). The beautifull glacier North wall is particularly important from the mountaineering point of view. The first ascent as made from Peter Fuchs, Paul Grohmann and Georg Samer "Josele" on July, 24th 1865 , just 10 days after the first ascent of Matterhorn. 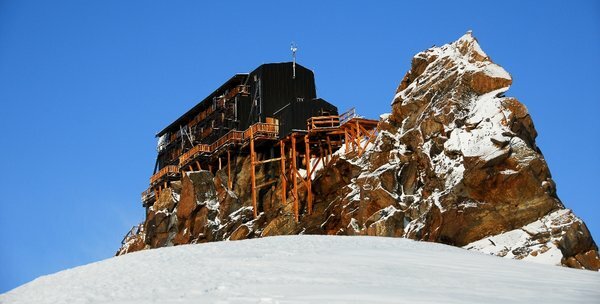 The Gran Pilastro hut / Hochfeiler Hütte, (m.2710), is the ideal starting point to the summit of Gran Pilastro (Hochfeiler), it is located in a beautiful panoramic position on a small terrace, over the Glideferner glacier. Opened in 1986 from the Sterzing section of the AVS, it offers 90 beds. A final note. If you are still at a loss what mountains you see, use the PeakVisor app to help you out. It will become an impartial judge in any bet you make with your friends about the mountain name. PeakVisor will show the name, the height and much more.